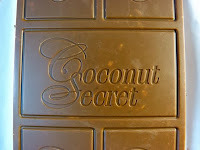 Today was Day #4 of Chocolate and Coconut Theme Weeks. 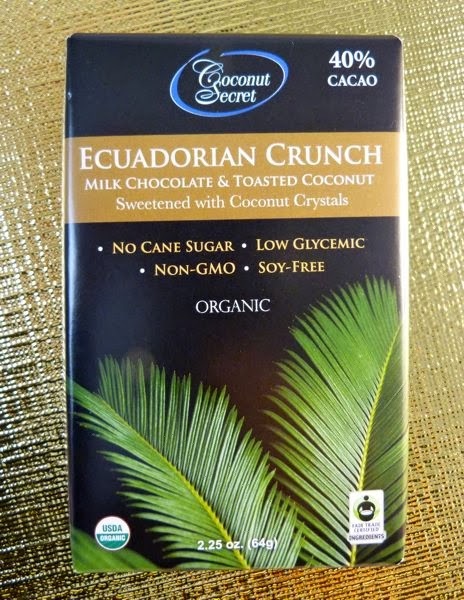 The Ecuadorian Crunch bar from Coconut Secret (Leslie's Organics) in Mill Valley, CA was made with slightly soft and sweet (40% cacao) organic milk chocolate, that was quite tasty. Shredded, toasted coconut provided good flavor and slightly crispy, almost crunchy, texture to this bar. 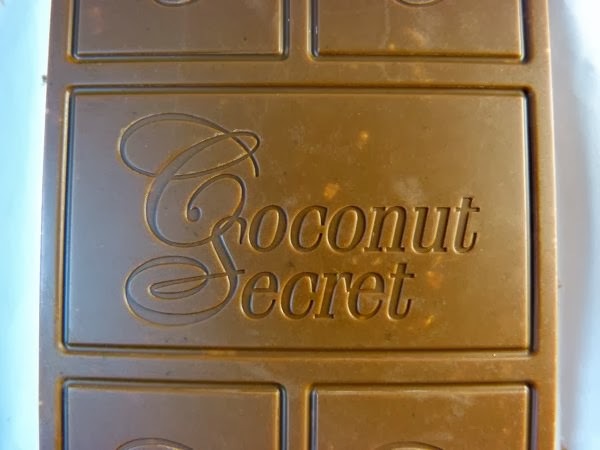 The company markets a range of chocolate bars sweetened with coconut and coconut sugar (as well as coconut flour, crystals, nectar, aminos and vinegar). Coconut palm sugar* tends to minimize blood sugar spikes and I enjoyed the slight caramel flavor in this bar -- as I have previously in other chocolates using this sweetener. Coconut sugar may offer a healthy sweetener alternative (to processed cane sugar) for those watching their blood sugar. *Coconut tree blossoms are tapped for their sweet sap. This sap can be harvested sustainably, and my understanding is that coconut palm trees may be tapped for up to 20 years. Coconut Secret's coconut palm sugar is produced in the Philippines.